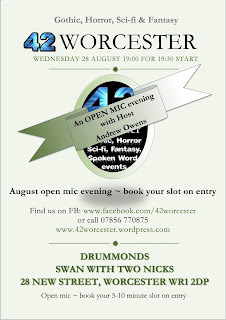 Tomorrow night sees again my monthly trip to perform my work at 42 Worcester. I love 42, it's one of my favourite venues to perform at. 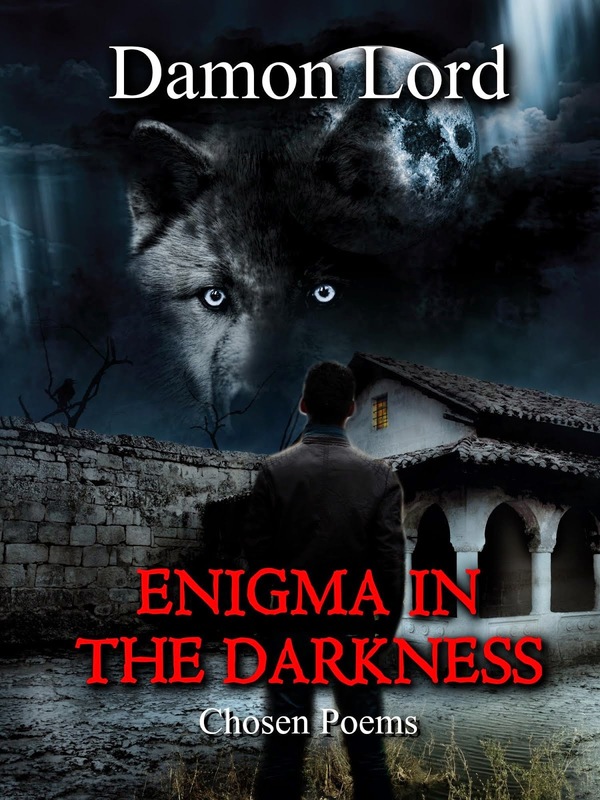 I'll be reading a new horror story, which is a parody of a well-loved book and TV series. I just finished writing it tonight! Do you want to get involved too? 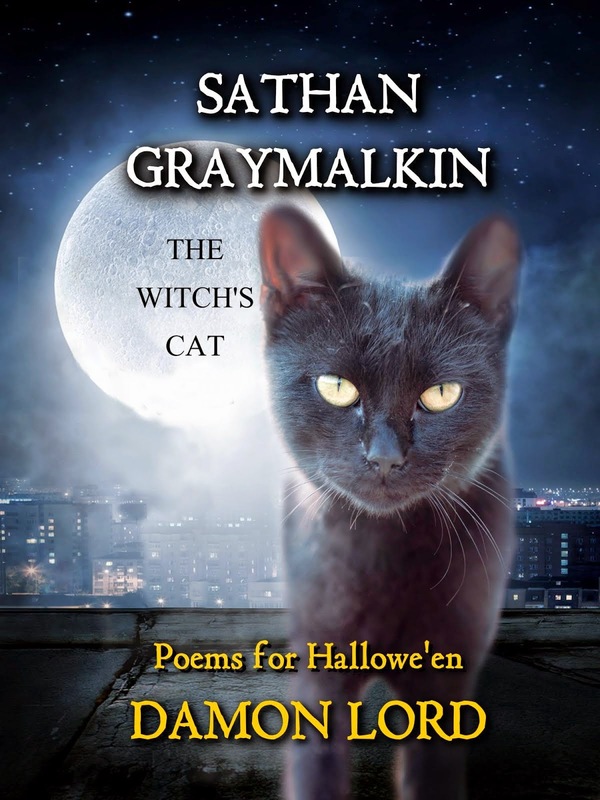 Why not join us and read as well! 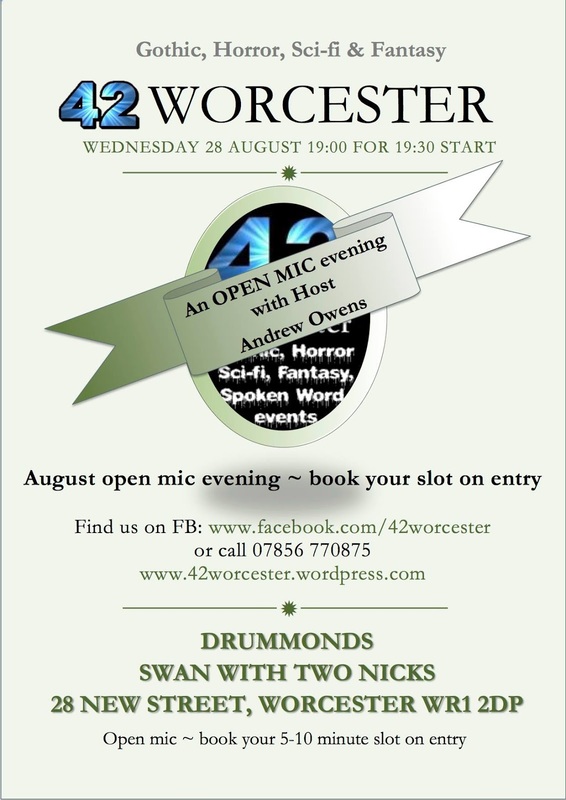 Gothic, Horror, Sci-fi & Fantasy event "42 Worcester" last Wednesday of the month at Drummonds, (28 New Street, Worcester WR5 1BU) 7pm for a 7:30pm start. MC Andrew Owens. Sign up on the night and book your own performance slot. Anything goes! Never tried "42"? Well now's the time. During this one off event there will be no restrictions apart from time (slots up to 10mins). Perform whatever you like. Come and be apart of the warm and friendly atmosphere and show us what you got! It is sure to be a fun evening, one not to be missed. So turn up, book a slot, relax and enjoy the show. We'd love to have you. Also, "42" is proud to welcome Ruth Wheeler as our special guest for the evening. 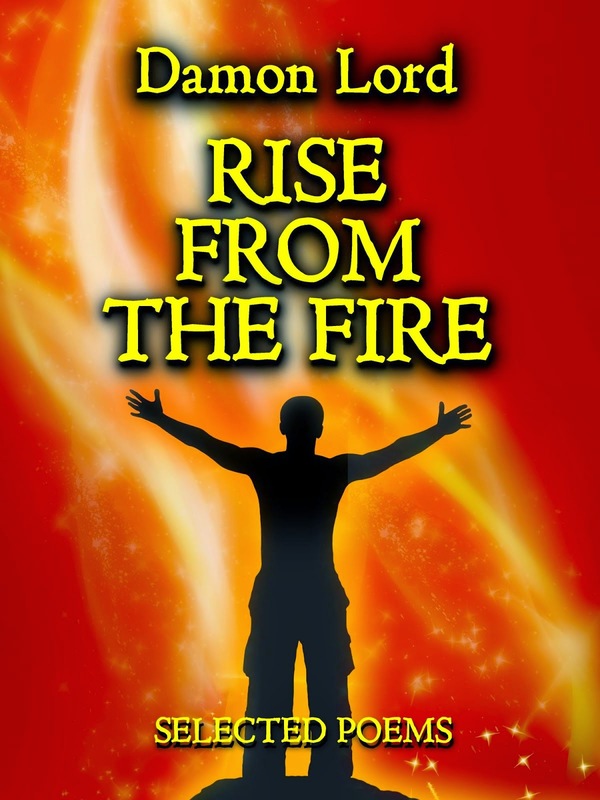 Born in Birmingham, Ruth Wheeler has always enjoyed writing from an early age. Her debut novel, ‘All Aliens Like Burgers’, was published by Hirst Publishing in 2010. The audiobook of the same name was released in 2011 by Spoken Word Audio, read by Debbie Chazen with music by composer John Nicholls. Her follow up novel, ‘Do Aliens Read Sci-Fi?’ was released in May 2011. Both novels feature Tom Bowler, a burger boy who makes strange new friends and enemies during his adventures on a planetoid called Truxxe.